On a cold December day in 1992, Dennis and Bob sat down in a rented recording studio and had a conversation about the coming new year. They talked about what 1993 might hold and especially about those resolutions that often come with the turning of the calendar. Find out how well Bob and Dennis kept their resolutions, as we turn the clock back a quarter century. Bob: So how long will it be before you break the resolutions you’ve made for the new year? Dennis Rainey says that depends on how serious you are about change. Dennis: I think one of the reasons we don’t keep our resolutions is we really don’t start out with a commitment to really do it. We may be serious about it at the time we made it; but we’ve not dealt with the heart issue that is involved and then have the necessary disciplines associated with it to really change, once and for all. This is FamilyLife Today for Monday, January 2nd. Our host is the President of FamilyLife®, Dennis Rainey. I'm Bob Lepine. So why do so many of our resolutions fall by the wayside so quickly? Is there anything we can do to be more resolute? We’re going to discuss that today and have a little fun as well. Stay with us. Bob: Here’s the reason we’re asking this—Dennis and I have just been listening back to a program that, actually, we’re going to share with you—a program that was one of the first programs that we recorded. Dennis: Pro-grm [slurs last syllable]. Dennis: But then I had to break Bob—as he concludes this broadcast—I want you to listen to how many syllables FamilyLife has. There’s no way the tongue can move that fast. Bob: There was a debate/a discussion about whether our program should be called FamlyLife Today or FamilyLife Today. Is Family a three-syllable word or is it a two-syllable word? Bob: If you haven’t called or written, we’d love to hear from you. Bob: Our address is Fam-i-lyLife Today. Again, that’s Fam-i-lyLife Today. Dennis: How did you do that?! Bob: I was doing my very best Al Sanders imitation is what I was doing. [Laughter] Doesn’t that sound a little like Al; don’t you think? Dennis: Al Sanders, folks, is the grandfather of Christian radio. Bob: —and a great friend. Dennis: He frankly is, from a human prospective, is the reason FamilyLife Today is on, all across the country. He believed in me before Bob joined us and before we had a broadcast. I’m not sure what he saw; but 25 years later, we’re still standing. Bob: He spent the first few years that we were on the air—and gave us a critique of every day’s program. We got a written critique from Al about the program—what we were doing right and what we were doing wrong—and really helped us shape FamilyLifeToday or Fam-i-lyLife Today as we called it back then. So here’s the thing—we’re starting 2017 today. 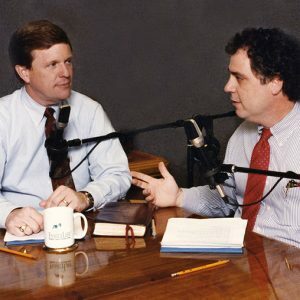 FamilyLifeToday went on the air in 1992; so this year, we will be celebrating 25 years of broadcasting. We thought it would be fun, on our first program of the year, to hear a program that we recorded during the first month we were recording. You were talking about New Year’s resolutions and making resolutions. We actually aired this right after Christmas in 1992. Listening back to it, there’s good stuff here that you were saying about resolutions. It just sounds a little funny to hear your voice and my voice, 25 years ago. Dennis: Rather than talking about it, let’s let them hear it. Bob: So let’s listen to it. Here’s Dennis Rainey and me talking about making New Year’s resolutions. Bob: There is something about a fresh, new year that, I guess, gives us all the sense that we can make a fresh, new start and kind of causes us to focus on some of the failures of the past and a real desire to conquer some of those weak areas in our lives; but most of us, by the time January is not yet half-done, have failed again and have fallen into the same old traps. Why is that, Dennis? Dennis: Well, I think one of the reasons we don't keep our resolutions is we really don't start out with a commitment to really do it. We may be serious about it at the time we make it; but we've not dealt with the heart issue that is involved and then have the necessary disciplines associated with it to really change, once and for all. Bob: So that those people, for example, who have decided to lose a few pounds, really are focused on that end result of wishing that they looked ten pounds skinnier but not focused on the lifestyle changes that are necessary to get to that point. Do you think the whole idea of resolutions is a bad idea? Dennis: No; I don't. I think the way I would rather approach this time of the year, rather than calling them a "resolution," is look at your life over the past year and talk about growth and change as a subject and not as a point in time just to make a resolution. I think there are people that make resolutions that do make a difference. I remember when I turned 40, one of my resolutions that year was to start exercising, and I've done that. So resolutions and commitments can be followed through on and can make a difference. However, I think for real change/real growth—the kind that doesn't disappoint us—the kind that we don't look back on with guilt, and regret, and with feelings of blaming yourself and going, "I'll never be able to achieve that," and then finally you just kind of throw the whole idea out the door and you give up, and you don't make any commitment to change—that's something we don't want to do as well. Bob: Losing a few pounds or quitting smoking—as important as those may be in the scheme of things—may be less consequential than some of the other more serious issues that we shy away from in facing our resolutions. I’m thinking of couples that really ought to take a long, hard look at their marriage relationship and the change that needs to take place there. Dennis: You're bringing up a great point, Bob. I think one of the things that needs to happen—at this time of the year and use the holidays to do this—is before you go back to work, take a hard look at your life and an inventory of your life. Galatians, Chapter 5, verse 19 to the end of the chapter, really, I think, have some exhortations for us here that really are timely. Verse 19 says, "Now the deeds of the flesh are evident, which are immorality, impurity, sensuality, idolatry, sorcery, enmities, strife, jealousy, outbursts of anger, disputes, dissensions, factions…"
It goes on to list a long grocery list of things that people have churning within them. The phrase that really stands out to me is the phrase, "Now the deeds of the flesh are evident… [emphasis added]" Now, that word, "evident," really means that you've taken the time to ponder and to really inventory life. I think one of the things Christians don't do—is they don't ever really face what is evident in their life, year after year after year. As a result, put up with some things that become habits and ingrained in who they are; and then they reach their middle-age years, 40s and 50s, and they give in and they don't ever change. That's not what Christianity was meant to be. Bob: Some of those habits / some of those ingrained patterns, left unchecked, will fester and bloom into real problems later on. —what the Bible speaks of as the years when you ought to have the most to say—those people are trapped in the midst of a prison of emotions that weren't dealt with, back at some pivotal points in their lives. Bob: It might be a good idea for husbands, as they face the new year / or for wives to sit down and look at Paul's charge to a husband or a wife in Ephesians 5 and ask themselves the questions: “Am I loving my wife as Christ loves the church? Am I respectfully submitting to my husband? Am I laying down my own life for my husband or my wife?” Looking back at the way in which we failed to live up to that standard in the past year—that could be a constructive step toward positive change. —I really do believe the Christian community is really well-versed in denying certain things about our own lives. I don't think it's any mistake that Jesus said, "Remove the log in your own eye before removing the speck in your brother's eye." Why?—because I think we're outstanding at putting up with logs in our own eyes and spotting the specks in other people's eyes. Then he stopped for a minute, but I just tried to drive home the point that the way his wife was responding to him was really not the issue. The issue that God was calling him to was how he was responding to his wife. Dennis: And, you know, you're never going to really respond properly to your mate if you first don't take a step back and do what we're talking about here today, which is take an inventory—and I mean a hard look / a fearless inventory. You know, a company, at the end of the year—right now, companies all over America are closed up—they're taking inventories. What kind of inventories do they take?—a partial one? No! —it's a fearless inventory. Why?—because their very life, over the long-haul, is dependent upon an accurate inventory and a proper valuation of that inventory. And relationships, I think, are worth far more than our companies. We ought to pause, and pull back, and just get out of the swirl of the events of the holidays and use this little window—right now / first of the year—and just pull back with a sheet of paper and take that fearless inventory and ask God to search our hearts and to know us. Bob: Well, that may be the first step toward constructive change—taking a fearless inventory—but there are a lot of folks, Dennis, who bog down right there and, recognizing the failures of the past, become incapacitated—they can't move ahead. Dennis: They do—they become defeated, disillusioned, disheartened, and they feel like there is no hope. But, you know, Galatians, Chapter 5, doesn't end with verse 21, just talking about the deeds of the flesh, which are evident. It moves on in verse 22 to say, "But the fruit of the Spirit is love, joy, peace, patience, kindness, goodness, faithfulness, gentleness, self-control." —and that is that we have to realize that real growth / real, true, Christian growth is usually not this dramatic, spiritual change that occurs instantly. Instead, real growth occurs like fruit grows. It occurs slowly—it must develop, it must go through seasons, and it must mature, and it needs to be picked. I think, sometimes, in the Christian community, we've done a lot of harm to people who are looking for a quick fix / who are looking for an emotional high. We don't talk to them about the long-haul nature of the Christian life and the process they must go through to really, really change. 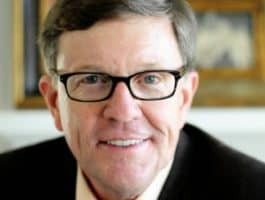 Bob: Well, folks who are facing that frustration of wanting to change, and wanting to rely on the power of the Holy Spirit to do it, but knowing, in the past they have tried and failed—speak to them. —and yet who were loved, who were forgiven, and who received grace in time of need. The reality of the Christian life is not perfect people, who always do everything just exactly right; but it is imperfect people, who fail repeatedly, but who have a God who stands ready to give them grace at those points. Now, to the person listening, who really suffers from always having to have everything perfect—who has to have every shoe lined up in their closet / a clean house every day—and there's always something unraveling around their lives—they just need to relax in the Spirit. It [Galatians 5:1] says: "It is for freedom Christ has set us free. Therefore, do not be subject again to the yoke of slavery." Some Christians are not enjoying the Christian life; they're enduring it. Now, I want to be quick to add here—there is pain in the Christian life. It's the fine print in the contract when we became a Christian. A lot of us do not talk about that when we introduce a person to the person of Jesus Christ, but there is pain involved in being a follower of Christ. Why? Because the One we are following is perfect; but the reality is, He has given us grace for when we fall short of His perfect ideal. Bob: Let me have you talk for just a minute to the average American husband. If he were to make a resolution for making his marriage better, what one resolution would you recommend to him? Dennis: I think the thing I would tell him to do would be to encourage him to go to his wife and say: "Okay; Sweetheart, I've got my pencil in hand. Tell me ten ways to love you better." I did this with Barbara a number of years ago, and you know what? It took her a while; but she came up with a list, and it wasn't your light-lunch list. It was some real specifics that I wrote down on the inside of my calendar. It was the things that communicated love—and, Bob, here’s the key—it was the things that communicated love to her. Bob: There's something very un-heroic for most of us men about the idea of loving our wife through folding the towel after we're done with it in the bathroom or carrying the laundry down to the laundry room; and yet, that may be the very thing that really endears us to our mate. Dennis: It really may. That really is another way, I think, of working out this subject of change in our lives—and that is practicing your Christianity in the little things. Jesus made it real clear in the New Testament that, if you want to receive much more / if you want to get the rewards, be faithful in the little. Don't just wait until you get the big stuff to be faithful—be faithful in the little things. Bob: To be fair, I've got to ask you if you could get the average American wife in our studio and give her the one New Year's resolution that she ought to make for her husband—what would it be? —that she's had the privilege of looking at with her husband, hopefully, and had a chance to develop—and that would be to write out / ask her husband to write out ten things that would communicate love to him. A key word for your husband may not be the word, "love," either, ladies—it really may be the word, "respect." One of the things that men really need, as men, is they need to be respected by you, as their wife. I think you may be surprised at what may fill that list and what issues are tied to that subject of respect. It may be finances, it may be schedule, it may be children, it may be issues like a sexual relationship; but the important thing is to find out what his needs are in that area, and then to do everything you can to really practically meet them. Bob: I'm thinking of those lists—on the insides of Day-Timer®s or tucked away in a drawer somewhere—and, again, the end-of-January phenomenon of looking at them and seeing how far short you've fallen in such a short period of time. Dennis: Well, I'm reminded of C.H. Spurgeon's great quote: "It was by perseverance the snail reached the ark." I like that word picture; because it really is through perseverance in the marriage relationship with one another / with our own children that really we build this thing called marriage, and we bring about change in each other's lives. I look back on my own marriage and my own relationship with Barbara, and the real gains are seldom in the sprint—they're in this little stuff that we're talking about; they're in the major commitments we're talking about; and they are in perseverance and a desire to do what is right, regardless of the response of the other person. Bob: This all involves grace on the part of our mates as well; doesn't it? Dennis: It really does. I think, if you don't have the ability to forgive and move on, then you're going to hold these things against each other. Someone has said, "The longer you carry a grudge, the heavier it gets." Forgiveness, as we said many times already on this program, forgiveness is really one of the keys to building a truly distinctive Christian marriage. If you're not a great forgiver, then you need to ask God to give you a forgiving heart. 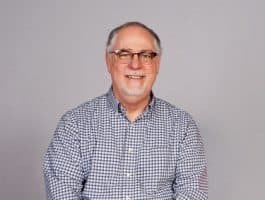 Bob: Well, we've talked about taking a fearless inventory, and we've talked about really relying on the power of the Holy Spirit for change to happen in our life. I have loved the suggestions of a husband and wife exchanging ways in which each of them can better serve and better love their spouse. As we head into the New Year, how would you challenge us for change? I'm thinking of a couple, right now, who came to the conference in Dallas, Texas. I'll change their names to protect them, although they would have no problem me telling this story at all; but Dan and Sue attended the conference there. Their marriage of 23 years was nearly over. At the conference, they had one of those life-altering confrontations with Christ. Their marriage was nearly over / they hadn't told anybody in their church; but at the conference, they really confessed their sins. It really was a time where there was great change that occurred in their marriage and in their relationship. Well, they left that conference determined, not only to have a great marriage, but to make a difference in other marriages and not to assume that everybody else in their church had marriages that were together. They took our small group Bible study, the HomeBuilders® Couples Series [currently, The Art of Marriage® Connect Series], back to a church of 180 couples in North Dallas. They began to promote the HomeBuilders as a Bible study for couples to get involved with. Well, some six/eight months later, they had over 100 couples, Bob, out of the 180, involved in HomeBuilders. They had designed t-shirts—with all the verses that are found in the HomeBuilders Couple Series Bible study—put those on t-shirts for all the members in the church. They had all these people doing songs. They built a whole movement within that church of couples, not only strengthening couples within the church, but reaching out beyond it—people were receiving Christ / people being brought into the church. It all started with a couple, who had just a few talents—and decided that they were going to take something that had happened in their marriage / they were going to personalize it—and press it into the fresh clay of other people's lives. One of my great desires for this program, as we continue to share these principles with our audience—is not just to give hope—but to also challenge people to use their talents; because, as they do that, there will be growth / there will be excitement. When you get involved in the process of pouring your life out for others, that's when your life really begins to take off. Bob: We’ve been listening to a program from the beginning—from the first month of FamilyLife Today / actually, the second month—this aired in December of 1992. Bob: But isn’t it interesting?—here, you’re talking about people getting involved and reaching out and helping other people. You’ve been saying the same stuff for awhile now. Dennis: I have; and I think it’s how you change the course of families—here, in America, and around the world—put the tools in the hands of laymen and women and challenge them to get involved and make a difference where they live. Bob: Your voice has deepened a little bit since then. Bob: I did sound squeaky. [Laughter] But the principles remain the same. You know, what I loved the most?—is we went on the air, folks, and people would confuse my voice with Bob’s. You have no idea of how that completely wounded him. Bob: It really was wounding. Dennis: He has scars—that some of you listeners came up and said you had no idea that he was a trained professional and I wasn’t—I was a rookie. Bob: —we’re going to feature some highlights from programs over the years. I hope our listeners, throughout the year, will enjoy some of the special programs we have coming up; because I think you are going to hear some of the best of the best from the last 25 years. Bob: That’s how it works!—again, “Thank you,” to those of you who gave at yearend / “Thanks,” to our Legacy Partners. If you’d like to start our celebration of 25 years of broadcasting FamilyLife Today by becoming a new Legacy Partner, we’d love to have you join the team and make a donation each month. You can find out more, online, at FamilyLifeToday.com; or call and just say, “I’m interested in becoming a Legacy Partner,”—1-800-FL-TODAY is our toll-free number. We’d love to hear from you. And we hope you’ll be back with us again tomorrow when we’re going to talk about the priority of prayer, going into the new year. Don Whitney will be here to help us talk about how we can use the Bible as our prayer guide in 2017. I hope you can be here with us for that. I want to thank our engineer today, Keith Lynch, along with our entire broadcast production team. On behalf of our host, the more mature-sounding Dennis Rainey, I'm Bob Lepine. We will see you back next time for another edition of FamilyLife Today. Bob: See, you can’t even do it! Bob: Just let me do it; alright? Dennis: You listeners couldn’t tell the difference; could you? Bob: Help for today. Hope for tomorrow.